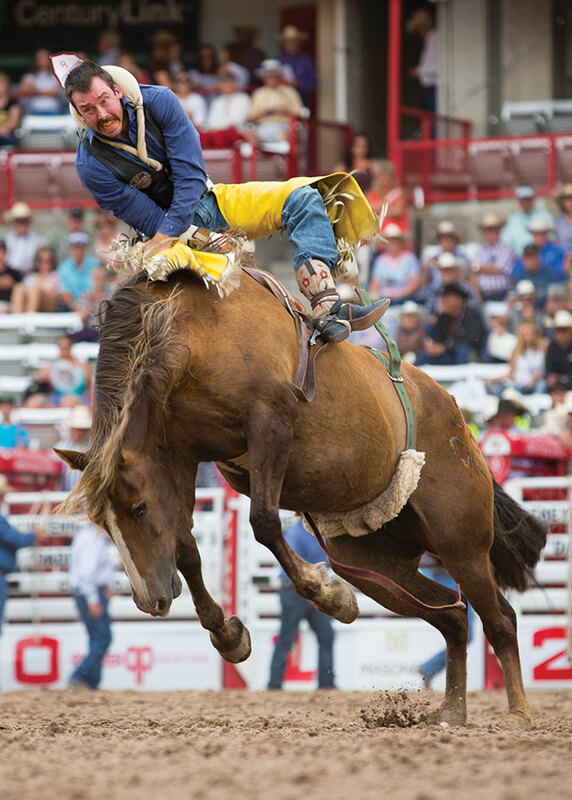 Cheyenne, Wyoming's most famous annual event is Frontier Days, which features professional rodeo competitions and Western-style entertainment. Ride into Cheyenne and Laramie, Wyoming, where they celebrate the Old West every day. When you are traveling to or from Gillette, Wyoming, for FMCA’s “Wanted In Wyoming” convention July 18-21, Cheyenne and Laramie, Wyoming, are prime places to rest. You’ll find many attractions and major western events that will make you want to linger. The towns are easily accessible via Interstate 25 or Interstate 80. Wyoming’s capital city, Cheyenne, has appeared multiple times on the list of 10 “True Western Towns” by True West Magazine. Fans of America’s Western culture flock to this town in the southeastern corner of the state, about 100 miles north of Denver, Colorado. American Indians were the first inhabitants of the area, and the town was named after a local tribe that pronounced the name “shai-en-na.” They were followed in the 1860s by Union Pacific Railroad construction crews, and then by troops from cavalry Fort D.A. Russell (now Warren Air Force Base) and a military supply depot called Camp Carlin. By 1880, wealthy cattle barons also had moved into the town. Cheyenne’s most famous annual event, Frontier Days, began in 1897. Today people arrive by the truckloads to watch professional rodeo competitions and take in Western-style entertainment. Horse-drawn parades, thrilling aerial acrobatics from the U.S. Air Force Thunderbirds, and more make this a fabulously famous event. In 2018 it runs from July 20-29, perfect timing for RVers who want to check it out after the FMCA convention in Gillette. Whether you attend the celebration or not, visit the Cheyenne Frontier Days Old West Museum. It has paintings, sculptures, photos, and a huge array of wagons and carriages. Little kids will have fun in their own activity space filled with cowboy-related furnishings. Cheyenne lets visitors choose their preferred way to see its many sights. The Cheyenne Street Railway Trolley takes you on a fully narrated history tour of the city. With the help of a walking tour brochure from the Cheyenne Depot visitors center, you can enjoy seeing things at your own pace. Eight-foot-high, brightly colored cowboy boot sculptures dot the area. Painted by local artists, there are 19 of them, so it’s fun to see how many you can find. Since it is the state capital, Cheyenne has several buildings worth checking out; however, the beautiful capitol itself is closed for renovations until 2019. The governor no longer lives inside the historic Governors’ Mansion, built in 1904, but it is open after receiving a $1 million renovation. Each room reflects a certain period in Wyoming history, through the late 1960s. Admission is free. A close-up look at the state’s history can be had at the Wyoming State Museum. Kids are attracted to a room especially for them that displays vintage toys and clothing along with dinosaur fossils. Yellowstone National Park and other national parks in Wyoming are examined at the National Park Service exhibit. Admission to the Wyoming State Museum is free. Shoppers will find that the city has a treasure trove of Western wear, furnishings, and gifts. Also, it harbors some smaller, no-less-important collections at the Cowgirls of the West Museum; the Nelson Museum of the West, which has more than 3,700 artifacts; and the Messenger Museum, where displays incorporate items going back to 1810. If your traveling group includes a railroad buff, he or she will want to explore the museum inside the Cheyenne Depot. This National Historic Landmark building, built in 1887, also houses a restaurant and the town’s visitors center. It commands attention in the open space of the Depot Plaza, which hosts live music and vendors selling food and drink every Friday evening during the summer, 5:30 p.m. to 8:00 p.m.
Union Pacific engine #1242, also called Ol’ Sadie, is at Cheyenne Botanic Gardens in Lions Park. Another train-buff spot is Holliday Park, home to Old Number 4004, the Big Boy steam engine. Built to pull a 3,600-ton train over steep grades, it is one of the largest steam engines in the world. Very impressive. And the state’s oldest steam engine, Ol’ Sadie, came into existence in 1890 and now resides in Lions Park. Note the unique fence made up of old railroad parts constructed by its last engineer. One of many parks in the city, Lions Park is also the location of Cheyenne Botanic Gardens, where you enjoy a nature break while wandering through 27 different landscapes. A new addition is the Paul Smith Children’s Village, where all ages learn about sustainable technologies through interactive displays. If fishing, boating, hiking, biking, wildlife viewing, or geocaching is on your list of vacation activities, head for Curt Gowdy State Park, 24 miles west of Cheyenne, midway between there and Laramie. Three reservoirs and an “epic” trail system (so dubbed by the International Mountain Bicycling Association) offer opportunities for recreation in the foothills of the Laramie Mountains. Elevations range from 6,800 to 7,900 feet. Some of these same activities are enjoyed 35 miles west of Cheyenne at Medicine Bow National Forest. The Forest Service has included it in a huge area called Medicine Bow-Routt National Forest and Thunder Basin National Grassland. The Vedauwoo (pronounced vee-da-voo) part of Medicine Bow is a fascinating collection of rock formations in all shapes and sizes. It is easily accessible from I-80 between Cheyenne and Laramie. On I-80 south of Cheyenne, you can view large, furry bison at Terry Bison Ranch. This facility has plenty of RV camping sites, but it is still best to secure reservations (see the campground list that accompanies this article). Once there, you can see and do a wide “range” of activities, and even take a train tour of the ranch. Sample a bison burger, rated the best in the state by USA Today, at the ranch’s on-site steak house. Laramie lies 48 miles west of Cheyenne, and was settled around the same time. It rests in a scenic location on the banks of the Laramie River in the foothills of the Snowy Range Mountains. 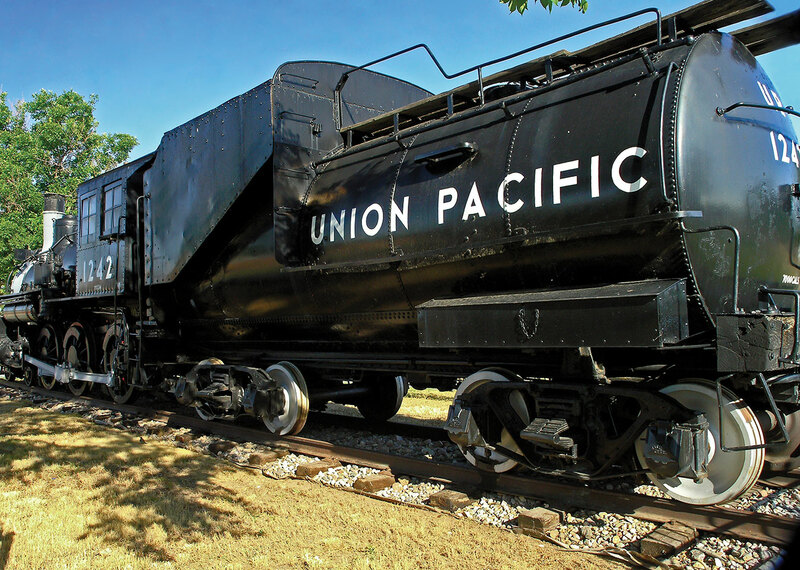 Like Cheyenne, it owes its existence in no small part to the Union Pacific Railroad. That legacy is remembered at the Laramie Historic Railroad Depot and adjacent Railroad Heritage Park, which has fascinating railcars and a former Union Pacific steam locomotive. Butch Cassidy was once one of the most famous residents at the Wyoming Territorial Prison in Laramie. He landed there after a Wyoming rancher accused him of stealing a horse. For approximately 18 months (around 1894 to 1896), Cassidy behaved himself well enough to gain an early release. Visitors to the 1872 sandy-colored stone structure see prison cells, the laundry where inmates worked, a dentist’s office (with instruments you would not want in your mouth), and additional buildings. Pick up a brochure for a self-guided tour. Admission is $5. Ever wondered just how large a Tyrannosaurus rex was? To find out, stand beside the life-sized statue of one outside the University of Wyoming Geological Museum. Once inside, visitors react with a “Wow!” as Big Al greets them, since he occupies most of the entire room. Big Al is a genuine Allosaurus skeleton, and scientists say the creature could have been larger, as it died before full maturity. Elsewhere in the museum, colorful murals show prehistoric creatures in their environment. Mineral and gem exhibits also treat the eye. The museum is one of several free collections on the University of Wyoming campus. Check parking restrictions before you visit, however, as it’s probably best to take a towed vehicle. Visit www.uwyo.edu/geomuseum or call (307) 766-2646 for info. While on campus, you may also want to see the art museum, anthropology museum, and other collections. Ornate furnishings of the Victorian era fill 23 rooms of the Ivinson Mansion, completed in 1893, and now home to the Laramie Plains Museum. Changing displays related to sheep ranching, cowboys, and Indians offer additional views of area history. The hour-long guided tour is $10 for adults and $7 for seniors. To get a feel for life here during the Old West, download the free Laramie app (available at the App Store and on Google Play), which has an interactive historical adventure tool called Legends of Laramie. It lets you hear entertaining stories as you walk around downtown. While there, you also will see large murals decorating some buildings. Watching wild horses run free across the grassy plains gladdens the heart. Hundreds of them roam at Deerwood Ranch, 35 miles west of Laramie. This was the first wild horse ecosanctuary on private land in the United States. Call ahead (307-399-9956) for an appointment to tour the grounds on an all-terrain vehicle (www.deerwoodranchwildhorseecosanctuary.com). Laramie’s big event each year is Jubilee Days, which celebrates Wyoming’s statehood. This year is a special celebration because Laramie itself turns 150 in 2018. Special events and many free-admission days at Laramie museums will be offered. The majority of the events for Jubilee Days take place July 12-15, 2018, good timing if you are touring the state before the Gillette convention. Rodeos, a carnival, live-music dances, and other activities are offered. Wyoming is known for being accessible to women politically. The first female to vote in the United States, with full equality to men, did so in Wyoming in 1870. Celebrating this and much more is a center honoring female political pioneers called The Wyoming House for Historic Women. Displays inside tell the stories of 13 honored women. Once you leave Laramie, where to go? Want a scenic alternative to I-80? Take the Snowy Range Scenic Byway, which is Wyoming Highway 130. Mountains, lakes, wildlife, and small towns along this former wagon road from the 1870s add up to eye candy and a slower pace. This isn’t a complete list, so please check your camping directory or the RV Marketplace found on FMCA.com for additional facilities.